No, I mean football, not its infernal politics and the shameful cancer of the insanity of death threats which have attached themselves to a once beautiful game. Let me hear again the debate over passing, finishing, shapes, defending corners, dribbling and getting the ball into the old onion bag. Give us a day on the south side of Glasgow this Easter Sunday when the league title will be decided by the defence-splitting diagonal or the sweet art of finishing. Not one plagued by the rants of lawyers nor the actions of lunatics. Football is on the road to hell, in a plague of financial distress with standards slipping on and off the park. And spectacularly so. Our game - the product - is being rattled from pillar to post by disregard for supporters who are asked to turn up for outrageously timed kick-offs and who are asked to laugh off last-minute postponements. Here's one for you. Sunday's Hibs-St Mirren game is all-ticket. Why? Do they expect the M8 to be jam-packed with an Easter Day Easter Road-bound cavalcade of Buddies? Is there not a stand in the new cavernous stadium which could comfortably accommodate the Saints support desirous of being in attendance? Was it necessary to ask supporters to make space in their day to pick up tickets at Greenhill Road? Meanwhile, on the subject of reorganisation they have perfected the art of procrastination. And leadership? We would be better off with a guide dog. It is sad, tragically sad, that we have spent a season discussing songs of hate and bungled reorganisation, ranting about the state of pitches and bank balances and trying to comprehend litigation. Give me back the days when, if we talked about a "Law man", his name was Denis. And so to the 90 minutes which will - and I say this with total disregard for those who will point out that between them the Old Firm will have a further nine fixtures to pursue - decide the destiny of the championship. 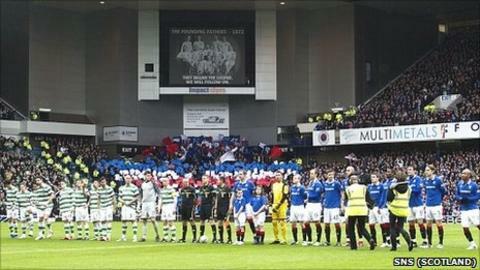 Rangers need to win at Ibrox. Any other result swings the title tide in Celtic's direction. And short of downright stubbornness, an incredible resilience and the wisdom of Walter Smith, I don't actually see what the team has in its locker that eclipses the energy and talent in depth that Neil Lennon has at his disposal. Celtic's flaw is their inconsistency. They were spectacular against Hibs but tottered against St Mirren, business-like against Aberdeen but electric against Kilmarnock. But when they play the way they did at Rugby Park - on a pitch which invites rhythmic passing - then they are good to watch. And, while I slavered down my chin at some of the Alexei Eremenko-inspired moves of Killie earlier in the season, I have to concede that Celtic in midweek had me reaching for the paper hankies once more. They were just brilliant. Meanwhile, on Saturday against St Mirren, I saw a Rangers team which dug ever deep into incredible reserves of resilience, a team which - if it does win the championship - will stumble over the finishing line with the players' tongues at their knees. What logic tells you Rangers will be champions, except, of course, that argument which insists that, when it comes to the Old Firm, there is no logic at all? For me, Celtic will not lose on Sunday. If they don't, they are on the home run to the championship.